10:27. Nino Hamburguesa splashed Villano III Junior. Keyra & Maravilla attacked Shani to get a title shot. 7:15. Carta Brava pulled Laredo Kid's mask (after Laredo Kid already has a mask pulled off) and speared him to get the pin. 6:13. Kross choked out Dave the Cown. 10:22. Pagano beat Texano with a legdrop. Lider & Texano had minor issues. Cage seemed to either suffer a leg injury or come in with one. 13:08. Earlier, Demon & Wagner brawled and Los Mercanarios and Konnan helped him out. 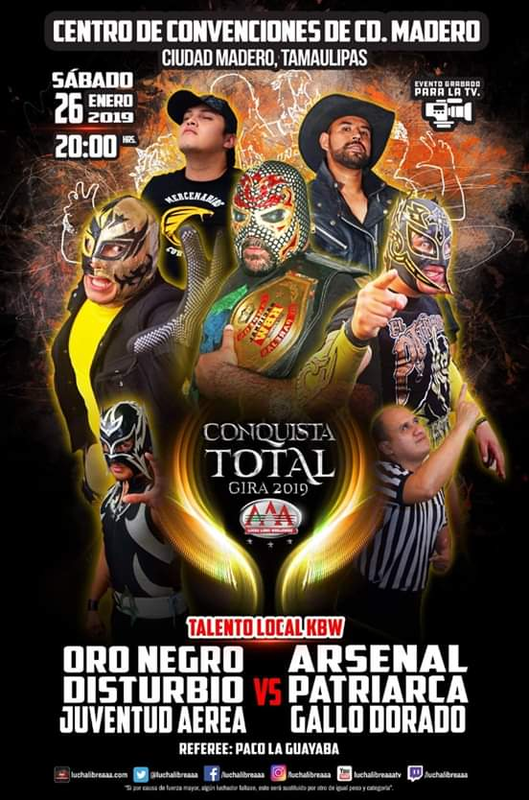 Konnan put Fantasma in charge of getting the mega title from Fenix. Also, La Parka introduced his son Hijo de La Parka as training to join AAA. Vampiro welcomed him, while also repeating his challenge to Konnan for a loser leaves town match and promising a surprise for Los Mercenarios. In the match, Fantasma hit Hijo de La Parka, then beat Parka after a foul and a martinete. The rudo left Psycho & Hijo de La Parka unmasked. 15:01. Hijo del Viingo beat Averno with a 450 splash. Vikingo & Myzteziz replaced Drago (weirdly double booked) & Laredo Kid (travel issues).